Hailey Baldwin gave her Fyre Fest pay to charity, but what amount? | SHEmazing! Hailey Baldwin gave her Fyre Fest pay to charity, but what amount? In case anyone wants to hear more about the sh*t-show that was Fyre Fest, we HIGHLY recommend the Netflix documentary. The whole thing was insanity, but models and influencers who shared those infamous orange tiles to their Instagrams were paid a huge amount to do so, despite knowing nothing about the actual festival. Rumour has it that Kendall Jenner was paid a whopping $250,000 for her post marketing the campaign, which is madness, but Hailey Baldwin has revealed that she gave her pay to charity. The model and wife of Justin Bieber was a guest on James Corden's US talk show game Spill Your Guts, but remained candid on how much the actual amount was… which was probably wise. While she did refuse to reveal the digits, she replied: "I’m not going to share but it made for a very generous donation to charity." Not one to let things go easily, Corden joked; "You gave the money away after you saw how… great it was." Hailey had to laugh that one off, saying nervously, "Yes, I did." The chat show host made sure to call the 22-year-old supermodel 'noble' for her efforts. We're glad something good came out of the whole thing. Baldwin and a group of models were flown out to the Bahamas, including Bella Hadid and Kendall Jenner, in April 2017 to film a promotional video for the music festival. The event was created by rapper Ja Rule and entrepreneur Billy McFarland using fraudulent funding on McFarland's part, who was arrested and sentenced to six years in prison. He was let out on $300,000 bail but continued to create fraudulent businesses while on probation, awaiting trial. Recent reports now state that Hailey and Bella Hadid, and influencers involved in the festival who are represented by IMG modelling agency would be subpoenaed as part of the criminal investigation into the disastrous event, which was later cancelled. 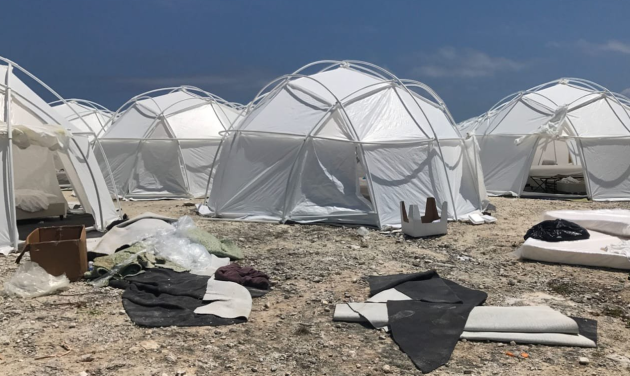 Billboard claim that the subpoenas aim to discover more about the reported $1.4 million budget that Fyre allegedly had to book artists and talent. McFarland allegedly spent $10 million on the music festival, despite the chaos of no accommodation, water, food or artists.